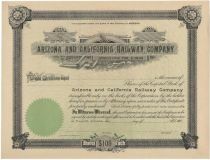 Chartered in 1903, the Arizona and California Railway ran from Matthie to Cadiz, Arizona, upon its completion in 1910. The following year, it was merged into the California, Arizona and Santa Fe Railway, an affiliate of the Santa Fe. 190-, Arizona. Unissued stock certificate. Green / White. Green seal at lower left. Ornate border.